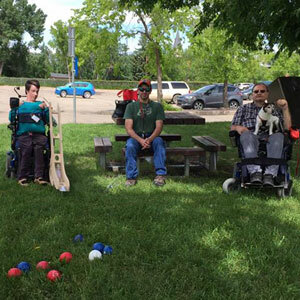 In partnership with Grande Prairie Wolverines, and Paralympic Sports Association, Boccia and Power Soccer is provided in Grande Prairie. Registration for programs is through the GP Wolverines, and more information regarding specific dates and registration is available at www.gpwolverines.com. Boccia is a Paralympic sport that is based off of the Italian game "Bocce". Boccia is adapted so all ages and individuals can participate. Individuals will learn new skills, proper technique and different strategies to take down your opponent. Boccia is a fun strategic game that forces you to be precise! Family and friends of all ages and abilities are encouraged to come give this fun game a try! Individuals of all ages and abilities are welcome to participate. This Boccia program introduces the sport in a fun, supportive environment to develop both physical and cognitive skills. Players are introduced to different drills and strategies. Individuals of all ages and abilities are welcome to participate. Family and friends of all ages and abilities are encouraged to come give this fun game a try! There are opportunities to compete provincially, nationally and internationally. Requirements to compete at these levels can be found here. No experience is required and all equipment including ramps. Reserve your spot by contacting info@gpwolverines.com or 780-402-3331. Powerchair soccer has been described as “playing soccer in go karts!” by our athletes. Plastic or metal footguards are attached to the front of power wheelchairs to maneuver a giant soccer ball. It is a fast paced sport that requires teamwork and skillful driving, which helps to build power-chair skills, dexterity and hand eye coordination.